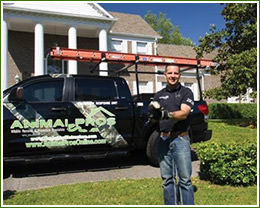 Animal Pros offers humane and permanent solutions for wildlife control and animal removal to homeowners, property managers, businesses, and government in Gainesville. We achieve this by using the most advanced technology in detection, prevention, repairs, and clean up of wildlife damage and wild animal problems. We are looking for quality wildlife technicians. Please visit our Careers page for more information. Start a new Career today! Wildlife removal is not just a job to us; it is a passion and way of life shared by Gainesville Animal Pros Certified Wildlife Specialists. With the largest staff all over the southeast, there is no sub contracting here. We are equipped and staffed to adequately handle animal removal, quality repairs, restoration / clean up, along with excellent customer service, providing a permanent solution and peace of mind protecting your family, home, and business. Gainesville Animal Pro’s initial visit includes a visual inspection of your home, attic and crawlspace, species of animal causing problems, wiring, insulation, ductwork, and other animal evidence to accurately pinpoint the kind of animal or animals causing the damage. You will be given a Personalized Inspection Report, detailing your needs and describing all your options as well as an itemized estimate for any recommended Gainesville Animal Pro’s services. Why are wildlife problems increasing in the Gainesville and Middle Florida area? Continual development and building of wooded areas have contributed to a increase in human – wildlife conflicts. Animals are being accustomed to living residentially. In addition, Animal Control has discontinued service for wildlife problems as a result of Government budget cuts. Wildlife assistance is available through private companies statewide, as Animal Pros is the largest. We offer safe, fast, and effective wildlife and animal removal solutions, with specialists in every aspect of animal control. We are State Certified and highly trained, and offer professional advice and solution services for homeowners, businesses , and Municipalities. When wildlife problems hit close to home, there are several things to keep a eye out for not only on the outside of your home, but inside as well. Pay special attention to scratching noises, pitter patter of feet, strage odors, and droppings in the interior, as any of these are a sign of a animal problem. There are several things to look for on the outside of your home, and it is best to get a professional wildlife inspection. Our highly trained technicians are available 24 hours a day, and can in most cases just smell the air in your home to diagnose what problem wildlife is there. Keep Trees and Bushes trimmed 4′ to 5′ from home. Ensure there are no openings in your attic or crawlspace. Check your foundation and roofline. Keep debris in your yard to a minimum, because wildlife will take that opportunity to use it as shelter. Avoid feeding wildlife, or using bird and squirrel feeders, because this will attact wildlife and keep them in the area. Be proactive. If you notice activity, call us today. Our specialists understand wildlife repair and can take the proper steps to ensure animals cant get back in.